Now that we have had a look at Apple’s latest offering in the world of wearables, it’s time to dig into the latest from one of the original fitness tracker manufacturers, Fitbit. Replacing the Charge HR in Fitbit’s lineup is the new Charge 2, promising a few upgrades including a larger OLED display, at the same price point. How does it compare to the Apple Watch? The Charge 2 is still a little behind the Apple Watch in terms of some more advanced features; it remains only sweat and splash proof, not truly water resistant, and relies on a compatible smartphone for GPS. Unlike the Apple Watch, however, the Charge 2 is capable of tracking stair climbing and sleep, thus earning the title from many reviewers of the ‘best bang for your buck’ fitness tracker. What has changed from the Fitbit Charge HR? So, other than the larger display then, what has changed from the Charge HR? At Chipworks, the easiest way to find out is to pull up a comparison search in Inside Technology, which results in a table much like the one you see below. Notable changes include the STMicroelectronics BLUENRGCSP low-energy Bluetooth solution in the slot formerly occupied by Nordic Semiconductor. The SiTime SiT1532 oscillator, while new to Fitbit, has previously appeared in many Apple devices including the Apple Watch, Pencil, iPad Pro, iPhone 7 and 7 Plus, and Apple TV. Power management remains with Texas Instruments, but has received an update to the BQ25120YFP 700-nA low IQ highly integrated battery charge management solution. If you’ve read our teardown of the Fitbit Alta, you might also recognize the STMicroelectronics LIS2DH 3-axis linear accelerometer. Another search of Inside Technology, this time using the Genealogy feature, reveals this device has been a favorite not only of Fitbit, but also of competitors such as Misfit, ASUS VivoSmart, and Jabra. 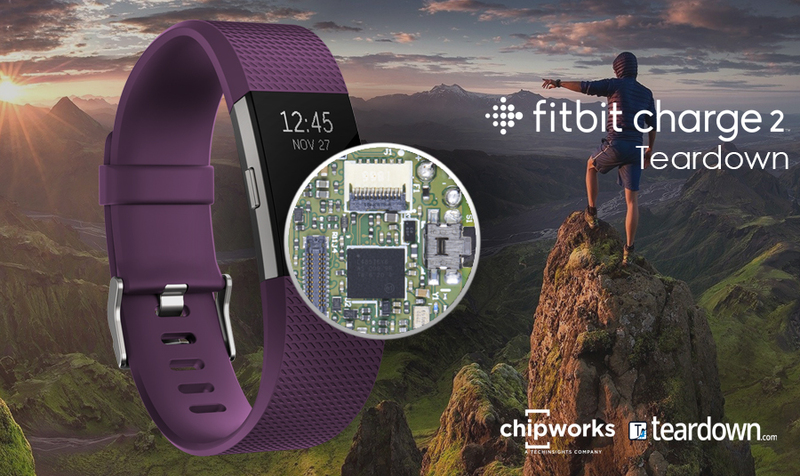 Fitbit has also chosen to stick with STMicroelectronics in the microcontroller (MCU), changing only the part numbers, from the STM32L151DY and SGVG in the Charge HR to the STM32L4 ultra-low-power MCU, a device not seen before by Chipworks. The L4 series is an upgrade from the earlier L1 series, with an ultra-low power mode (8 nA). It “shatters performance limits in the ultra-low-power world. It delivers 100 DMIPS based on its ARM® Cortex®-M4 core with FPU and ST ART Accelerator™ at 80 MHz.” To aid in the design of the Fitbit, it is also pin-to-pin compatible with the other STM32 series MCUs. On top of those, even more wins were recorded for Texas Instruments and STMicroelectronics in the Charge 2. These include Texas Instruments’ TPS61046 highly integrated boost converter, and STMicroelectronics’ LPS35HW ultra-compact piezoresistive pressure sensor and BALF-NRG-01D3 ultra miniature balun. While none of these new features are huge differentiators, Fitbit’s choice to simply fine-tune an already successful device should help them to keep their place as the most recognized brand of fitness wearables in the market.